I’m not sure why but I feel this blog post is really late, in reality it’s still January and what can I say, Gurl needs time to get her act together. Anyway, rather than ‘New Years Resolutions’ I thought I’d do what I usually do and set myself some goals for the year. Some are pretty easy, some not so much but that’s what they’re goals. Ideally I’d love to be able to run 10km with a break by the end of the year. I really want to tone up too, when I used to horse ride I was in pretty good shape and now, a mixture of bad diet and no exercise means I’m out of shape and incredibly unfit. ‘New Year, New Me’ ay. Something I really should have started doing 2 and a half years ago when I turned 17. I’ve just never really felt the need to drive but this year I finish college and want to become more independent, it would also be nice to just be able to decided I want to go somewhere and go there straight away rather than needing to plan how I’ll get there. I love the UK, there are so many places that I want to visit like Brighton again, Edinburgh, Leeds and so many more places, maybe learning to drive will make this easier for me. Hopefully I’ll go on some adventures with college friends before they head off to University. I can’t believe how quickly my two years at college have flown. It’s insane that people that I would class as some of my best friends didn’t even know me a year and a half ago. Without a doubt college was my best decision. What will make it even more worthwhile would be leaving with a really good grade, I’m hoping for triple Distinction by the end of the year. A ‘job’ for me would ideally come in multiple forms. I would adore being able to blog as my job, even part time would be amazing. It’s something that’s really shared me to the person I am today and I wish for it to continue to be a huge part of my life as I grow and experience the trails and tribulations of life. One of the big things that I’d also love to do is open my own online shop. I currently study Graphic Design so have been taught so many valuable skills. I’m thinking notebooks, posters, postcards and so much more. Currently, rather than just turning off my laptop and getting into bed I end up watching YouTube videos, scrolling through Pinterest and just doing random things for an hour or so. This makes it difficult for me to fall asleep most night. I know to combat this I need to be off of technology at least an hour before I plan to go to bed to sleep. I recently purchased a Mindfulness colouring book, I love it and it’s the perfect way to unwind before bed. Something that I also want to do is fill in my ‘A Line a Day’ book. I’m so excited to fill this notebook in and I think it’s nice that at the end of the day even if I had a pretty crappy day I’ll pick out one good thing about the day. This one’s a little bit funny because I was speaking to my sister about her New Years Resolutions and one of her’s is to wear make up less. I feel really confident with and without make up but I do enjoy playing with make up looks and really want to start wearing makeup 3 or 4 times a week. Rather than seeing that I need to pick up a few things from my bedroom floor and leaving it, just do it then and there. Lily Melrose said in one of her blogs that if something needs doing and it only takes five minutes then she does it straight away rather than letting tasks build up. I;’m planning on taking on this attitude with things like college work too. 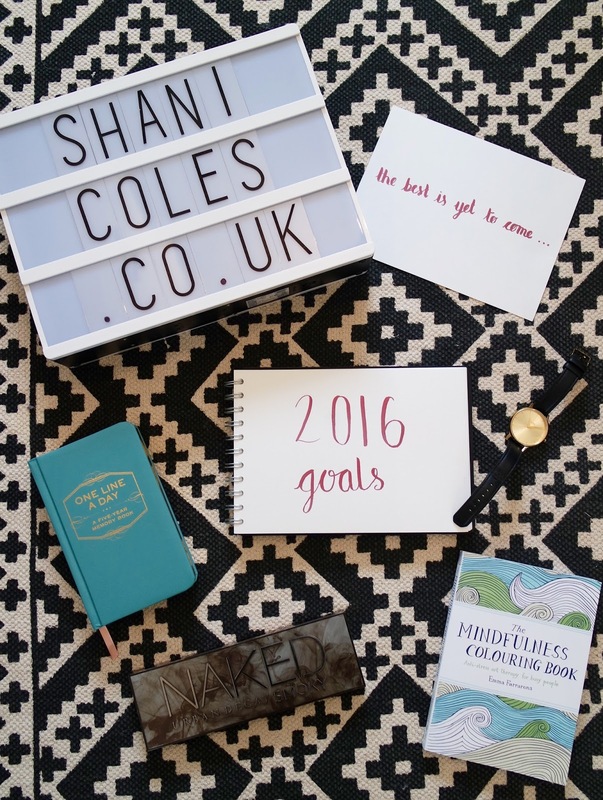 Now for a few goals specific to blogging. This is a huge goal but it would seriously be a dream come true for me. I’ve been blogging since Summer 2012 on various platforms and I really do work hard to produce good content. At the end of 2015 I really feel like I cam into my own with blogging and have found my own unique style. I hope to incorporate my Graphic Design background into the blog more this year. Again, an absolutely HUGE goal. I need to start my channel properly this year, again it’s something I’ve been attempting to do since 2012 and I desperately want to do it. I studied Film Studies at A level so really I have all the basic skills and knowledge to produce half decent videos. Practise makes perfect so 2016, let’s do this. This is slightly more achievable than the previous two, I’m hoping that blogging regularly will increase my readership. This will also help me develop my own style even more. Being able to drive will help this goal unbelievably. Fashion is one of my favourite ‘hobbies’ and I really want to bring outfits to my blog even more so this year. Along with seasonal lookbook’s on my YouTube channel too. A main channel video a week and hopefully a vlog on my second channel too. This will get easier as I get closer to the end of my final six months of education. As I said, I have the skills, I have all the equipment I just need more hours of daylight which currently I don’t have. With regards to vlogging, I love the idea of documenting events in my life and just random days out. I really want to get more involved with the blog/youtube community. I’m not talking fancy events, simply a little blogger meet up every now and again. Not many of my friends are massively into fashion or blogging so it would be nice to meet with like minded people very now and again. I’d also love to work with a brand or two this year. I think it could make my content more interesting, producing some content for a fashion brand would be a dream come true for me. Following on from the previous point, I really want to make friends with some blogger/youtubers. Even just meeting some bloggers in London would be really nice. I’d also love to create some YouTube collabs too. Now, I’m not going to be too strict on myself, however, I hope that by the end of the year I’ll have completed most of these goals. This year is going to see a huge change in my life, finally being free of education for the first time ever, it’s scary but also so exciting and I can’t wait to document all of the changes here on my blog and on my YouTube channels too. I also turn 20 which is freaking me out just thinking about it. Be excited and look out for new posts from me (hopefully) at least twice a week.